Dr. Hamilton-Craig is a Staff Cardiologist, Center of Excellence for Cardiovascular MRI, University of Queensland, Brisbane, Australia, and Department of Radiology, University of Washington, Seattle, WA; Dr. Slaughter is Director of Medical Imaging, Centre of Excellence in Cardiovascular MRI, The Prince Charles Hospital, Brisbane, Australia; and Dr. Maki is Director of Body MRI, University of Washington Medical Centre, Seattle, WA. Dr Hamilton-Craig s supported by the National Heart Foundation of Australia and the University of Washington Trans-Pacific Fellowship. Cardiac magnetic resonance imaging (CMR) is the sole imaging modality with the ability, in 3 dimensions, to assess cardiac morphology, ventricular function, perfusion, viability and imaging characteristics of the surrounding vasculature without ionizing radiation.1 CMR uses the same principles as other MR techniques with the addition of ECG gating in order to suspend cardiac motion. The increasingly sophisticated treatment of patients with cardiac disorders has created the need for accurate and reproducible measurements of cardiac chamber volumes and function.2 CMR has the ability to provide this information as well as assess edema, perfusion, viability and vascular anatomy. Black blood imaging can be used to create still-frame images with high spatial resolution for morphologic analysis (Figure 1). Bright-blood steady state free precession (SSFP) sequences provide moving cine images with a high signal-to-noise ratio (SNR) and excellent endocardial definition. Standard views are derived from their echocardiography counterparts; 4-chamber, 2-chamber (vertical longaxis), left ventricular outflow tract (3-chamber), and short axis stacks (Figure 2). Morphologic variants of atrial, ventricular, valvular,arterial and venous structures can be imaged with unsurpassed definition.3 The ability to image in any plane within the thorax is a unique strength of CMR, of particular advantage in congenital disorders. the descent of the mitral valve towards the LV apex, moving through the imaging plane. Allow for LV shortening by careful cross-referencing of planes to delineate the position of the mitral annulus at end-systole and end-diastole. In many centers, it is customary to use the LV short axis view to assess RV volume. However, the basal dimension of the RV is considerably larger than the base of the LV, and when errors occur in the base of the RV they may significantly affect accuracy, usually by underestimating RV volumes.8,10 The tricuspid valve annular plane lies apical of the mitral valve plane. When the same series of LV short axis views is used for RV measurements as for LV measurements, the basal end-diastolic and end-systolic slice positions may be difficult to determine. This is compounded because, in most cases, both RV and atrial walls are thin, rendering it difficult to identify the exact plane of the tricuspid valve. RV quantification can be improved by using axial views or, preferably, dedicated RV sequences where the tricuspid valve is imaged in the margin of the slice.10,11 Axial imaging has disadvantages in congenital heart diseases where the cardiac axis and the skeletal axis may not align, leading to inaccuracies in delineating the atrio-ventricular plane. T2-weighted (T2W) short-tau inversion recovery (STIR) imaging is a CMR sequence sensitive to increased myocardial water content, allowing the delineation of high-signal areas of myocardial edema. Increased mobile water content associated with edema appears hyperintense on T2W-STIR images (Figure 3).19 Quantification of myocardial edema, using tissue signal thresholds, has been shown to strongly correlate with ischemic time.20-22 Myocardial edema may be present after any form of myocardial injury such as myocardialischemia, acute infarction, myocarditis, sarcoidosis or trauma.19 CMR is able to assist in the diagnosis and surveillance of a range of cardiac disorders (Table 1). Early studies show that increased signal in the myocardium following intravenous Gd accurately depicted irreversible ischemic myocardial injury independent of age.23,24 This was subsequently confirmed by others.25 The presence and transmural extent of LGE following myocardial ischemia (Figures 3B and 4) gives important predictive information about the likelihood of functional recovery after revascularization.26-29 CMR is now considered the gold standard investigation for the assessment of myocardial viability. The anatomic mechanisms and quantification severity can be assessed by CMR. Echocardiographic measurements of regurgitation may be inaccurate, particularly in dilated ventricles.51 The 3-dimensional volumetric nature of CMR helps overcome the problems with inhomogeneity and eccentricity of regurgitant jets.52 Comparison of LV stroke volume from volumetric LV measurements can be compared with aortic forward flow measurements using phase contrast flow imaging in the ascending aorta. The regurgitant volume can readily be calculated.53-55 Regurgitant orifice area, most often calculated by the proximal isovelocity surface area (PISA) method inechocardiography, can also be performed by CMR.56 The CMR measurement of anatomic orifice area, however, has not been prospectively evaluated to provide equivalent prognostic information to echocardiography. Similar CMR techniques can be used for quantification of tricuspid, aortic and pulmonary regurgitation. In particular, phase-contrast flow quantification across the semilunar valves offer an accurate measurement of forward and backward flow,57 and may offer superior reproducibility to echocardiography. CMR provides the best imaging technique available for assessment of RV free wall contraction abnormalities and is particularly valuable in assessing patients with suspected arrhythmogenic RV dysplasia (ARVD).62,63 Regional wall motion abnormalities are more difficult to interpret in the RV than in the LV because of the structure of the RV free wall. Exaggerated diastolic distortion of the RV freewall, or the “accordion sign,” is also associated with genotype-positive ARVD.64 However, some systolic distortion of the RV, due to contraction of the moderator band and insertion of the trabeculae into the thin RV free wall, may be present in normal patients. There is also growing recognition of LV involvement in ARVD, which can be imaged by CMR.62 Identification of fatty infiltration of the RV wall by CMR can be supportive of a diagnosis of ARVD, but is not a reliable sign due to the thinness of the RV wall. It should be noted that fatty infiltration, as defined in the current diagnostic criteria, is a histological diagnosis not an imaging diagnosis, and the prevalence of RV fat by CMR in the normal population has not been fully elucidated. Contstrictive pericarditis is notoriously difficult to diagnose, often with subtle echocardiographic and invasive hemodynamic findings. CMR provides an accurate assessment of pericardial thickness, using double and triple inversion recovery sequences, as well as being able to non-invasively demonstrate ventricular interdependence. Real-time imaging allows assessment of the ventricular interdependence and abnormal septal motion seen in constrictive physiology. This is done in the LV short axis view with images, including the domes of the diaphragm,in order to observe respiratory motion. In spite of its advantages, CMR does have some limitations in patients with dysrythmias that affect ECG-gating, claustrophobia, implantable devices, and severe renal impairment. Parallel imaging has improved acquisition time, and automated software has reduced analysis time, however CMR remains a specialized technique requiring considerable expertise for both acquisition and interpretation. CMR uniquely provides accurate and reproducible measures of volumes and function of all 4 cardiac chambers and surrounding vasculature. It provides excellent morphological information with unparalleled definition between blood pool and myocardium. Combined with the known patterns of LGE, CMR provides a powerful tool for the diagnosis and quantification of myocardial infarction. It provides prognostic information prior to either revascularization or ventriculoplasty. Non-ischemic patterns of LGE may reveal infiltrative conditions that are often difficult to diagnose with other techniques, and which may significantly alter clinical management. 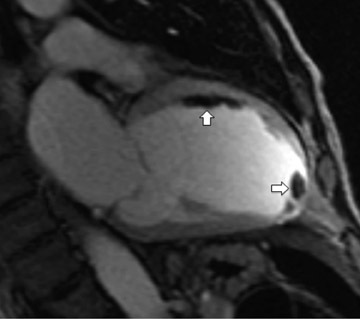 CMR is an ideal technique to evaluate complications such as intracardiac thrombus or valve dysfunction. It has significant advantages in evaluation of the RV, which is increasingly recognized as an important and prognostic factor in HF and congenital heart disease. Pohost GM. The history of cardiovascular magnetic resonance. J Am Coll Cardiol Img. 2008; 1:672-678. Marwick T, Schwaiger M. The future of cardiovascular imaging in the diagnosis and management of heart failure, Part 1. Circ Cardiovas Imaging. 2008; 1:58-69. 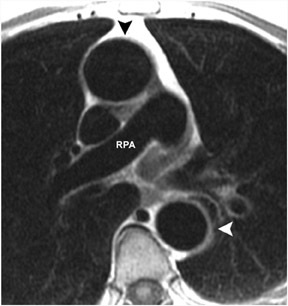 Slaughter R. Congenital heart disease in adults In: Manning W, Braunwald E, eds. Atlas of Cardiovascular Magnetic Resonance. 1 ed: New York, NY: Springer; 2009:153. Pennell DJ. Ventricular volume and mass by CMR. J Cardiovasc Magn Reson. 2002;4:507-513. Papavassiliu T, Kuhl HP, Schroder M, et al. Effect of endocardial trabeculae on left ventricular measurements and measurement reproducibility at cardiovascular MR imaging. Radiology. 2005;236: 57-64. Mor-Avi V, Jenkins C, Kuhl HP, et al. Real-time 3-dimensional echocardiographic quantification of left ventricular volumes: Multicenter study for validation with magnetic resonance imaging and investigation of sources of error. JACC Cardiovasc Imaging. 2008;1:413-423. Nagel E, Lehmkuhl HB, Bocksch W, et al. Noninvasive diagnosis of ischemia-induced wall motion abnormalities with the use of high-dose dobutamine stress MRI:Comparison with dobutamine stress echocardiography. Circulation. 1999;99:763-770. Grothues F, Moon JC, Bellenger NG, et al. Interstudy reproducibility of right ventricular volumes, function, and mass with cardiovascular magnetic resonance. Am Heart J.2004;147:218-223. Larose E, Ganz P, Reynolds HG, et al. Right ventricular dysfunction assessed by cardiovascular magnetic resonance imaging predicts poor prognosis late after myocardialinfarction. J Am Coll Cardiol. 2007;49:855-862. Strugnell WE, Slaughter RE, Riley RA, et al. Modified RV short axis seriesA new method for cardiac MRI measurement of right ventricular volumes. J Cardiovasc Magn Reson. 2005;7:769-774. Whitnah J, Mitsumori L, Branch K, et al. Efficiency and reproducibility of the right ventricular horizontal long axis MR imaging plane for the evaluation of right heart function.Proceedings of ISMRM 2006, Seattle, WA, USA, 2006. Arheden H, Saeed M, Higgins CB, et al. Measurement of the distribution volume of gadopentetate dimeglumine at echo-planar MR imaging to quantify myocardial infarction: Comparison with 99mTc-DTPA autoradiography in rats. Radiology. 1999;211:698–708. Rolf A, Nef HM, Mollmann H, et al. Immunohistological basis of the late gadolinium enhancement phenomenon in tako-tsubo cardiomyopathy. Eur Heart J. 2009;30:1635-1642. Kim RJ, Choi K, Judd RM. Assessment of myocardial viability by contrast enhancement. In: Higgins C and de Roos A, eds. 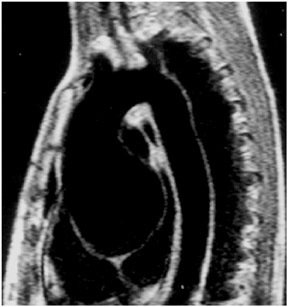 Cardiovascular MRI and MRA. 1 ed. Philadelphia,PA: Lippincot Williams & Wilkins; 2003:209–236. Tomlinson DR, Becher H, Selvanayagam JB. Assessment of myocardial viability: Comparison of echocardiography versus cardiac magnetic resonance imaging in the current era. Heart Lung Circ. 2008;17:173-185. Weaver JC, McCrohon JA. Contrast-enhanced cardiac MRI in myocardial infarction. Heart Lung Circ. 2008;17:290-298. Beek AM, Bondarenko O, Afsharzada F, van Rossum AC. Quantification of late gadolinium enhanced CMR in viability assessment in chronic ischemic heart disease: A comparison to functional outcome. J Cardiovasc Magn Reson. 2009;11:6. Thygesen K, Alpert JS, White HD, on behalf of the Joint ESC/ACCF/AHA/WHF Task Force for the Redefinition of Myocardial Infarction. Universal Definition of MyocardialInfarction. J Am Coll Cardiol. 2007;50:2173-2195. Abdel-Aty H, Simonetti O, Friedrich MG. T2-weighted cardiovascular magnetic resonance imaging. J Magn Reson Imaging. 2007;26:452-459. Aletras AH, Tilak GS, Natanzon A, et al. Retrospective determination of the area at risk for reperfused acute myocardial infarction with T2-weighted cardiac magnetic resonance imaging: Histopathological and displacement encoding with stimulated echoes (DENSE) functional validations. Circulation. 2006;113:1865-1870. Francone M, Bucciarelli-Ducci C, Carbone I, et al. Impact of primary coronary angioplasty delay on myocardial salvage, infarct size, and microvascular damage in patientswith ST-segment elevation myocardial infarction: Insight from cardiovascular magnetic resonance. J Am Coll Cardiol. 2009;54: 2145-2153. Abdel-Aty H, Schulz-Menger J. Cardiovascular magnetic resonance T2-weighted imaging of myocardial edema in acute myocardial infarction. Recent Pat Cardiovasc Drug Discov. 2007;2:63-68. Kim RJ, Fieno DS, Parrish TB, et al. Relationship of MRI delayed contrast enhancement to irreversible injury, infarct age, and contractile function. Circulation.1999;100:1992-2002. Wesbey GE, Higgins CB, McNamara MT, et al. Effect of gadolinium-DTPA on the magnetic relaxation times of normal and infarcted myo-cardium. Radiology. 1984;153:165-169. Rehwald WG, Fieno DS, Chen E-L, et al. Myocardial magnetic resonance imaging contrast agent concentrations after reversible and irreversible ischemic injury. Circulation.2002;105:224-229. Kim RJ, Wu E, Rafael A, et al. The use of contrast-enhanced magnetic resonance imaging to identify reversible myocardial dysfunction. N Engl J Med. 2000;343:1445-1453. Choi KM, Kim RJ, Gubernikoff G, et al. Transmural extent of acute myocardial infarction predicts long-term improvement in contractile function. Circulation. 2001;104:1101-1107. Beek AM, Kuhl HP, Bondarenko O, et al. Delayed contrast-enhanced magnetic resonance imaging for the prediction of regional functional improvement after acute myocardial infarction. J Am Coll Cardiol. 2003;42:895-901. Schvartzman PR, Srichai MB, Grimm RA, et al. Nonstress delayed-enhancement magnetic resonance imaging of the myocardium predicts improvement of function afterrevascularization for chronic ischemic heart disease with left ventricular dysfunction. Am Heart J. 2003;146:535-541. Bello D, Shah DJ, Farah GM, et al. Gadolinium cardiovascular magnetic resonance predicts reversible myocardial dysfunction and remodeling in patients with heart failureundergoing beta-blocker therapy. Circulation. 2003;108:1945-1953. McCrohon JA, Moon JC, Prasad SK, et al. Differentiation of heart failure related to dilated cardiomyopathy and coronary artery disease using gadolinium-enhanced cardiovascular magnetic resonance. Circulation. 2003;108:54-59. Casolo G, Minneci S, Manta R, et al. Identification of the ischemic etiology of heart failure by cardiovascular magnetic resonance imaging: Diagnostic accuracy of lategadolinium enhancement. Am Heart J. 2006;151:101-108. Hamilton-Craig C, Layland J, Seleem M, et al. 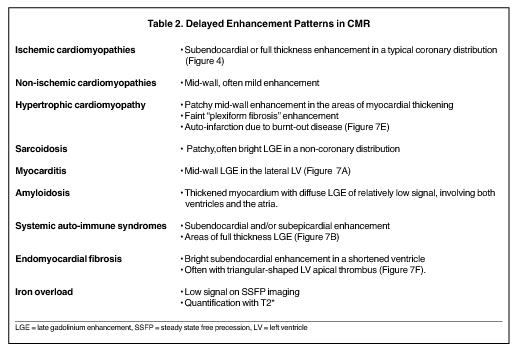 Can CT coronary angiography and cardiac MRI effectively exclude ischaemia in LV dysfunction? A prospective study. AbstractHeart Lung Circ.2009; 18:S27-S28. Lubbers DD, Janssen CH, Kuijpers D, et al. The additional value of first pass myocardial perfusion imaging during peak dose of dobutamine stress cardiac MRI for thedetection of myocardial ischemia. Int J Cardiovasc Imaging. 2008;24:69-76. Assomull RG, Prasad SK, Lyne J, et al. Cardiovascular magnetic resonance, fibrosis, and prognosis in dilated cardiomyopathy. J Am Coll Cardiol. 2006;48:1977-1985. Strugnell WE, McCann AB, Larsen P, et al. MRI findings in non-ischaemic dilated cardiomyopathy. Australasian Radiology.2006;50:P9. Larsen P, McCann A, Slaughter R, Strugnell W. MRI gadolinium enhancement patterns in patients with dilated cardiomyopathy. Society of Cardiovascular MagneticResonance 2007;February 2-4, 2007, Rome, Italy. Iles L, Pfluger H, Phrommintikul A, et al. Evaluation of diffuse myocardial fibrosis in heart failure with cardiac magnetic resonance contrast-enhanced T1 mapping. J Am Coll Cardiol. 2008;52:1574-1580. Chuang ML, Manning WJ. Left ventricular hypertrophy and excess cardiovascular mortality is late gadolinium enhancement the imaging link? J Am Coll Cardiol.2009;53:292-294. Butler CR, Thompson R, Haykowsky M, et al. Cardiovascular magnetic resonance in the diagnosis of acute heart transplant rejection: Areview.J Cardiovasc Magn Reson.2009;11:7. Kwon DH, Smedira NG, Rodriguez ER, et al. Cardiac magnetic resonance detection of myocardial scarring in hypertrophic cardiomyopathy: Correlation with histopathology and prevalence of ventricular tachycardia. J Am Coll Cardiol. 2009; 54:242-249. Suk T, Edwards C, Hart H, Christiansen JP. Myocardial scar detected by contrast-enhanced cardiac magnetic resonance imaging is associated with ventricular tachycardiain hypertrophic cardiomyopathy patients. Heart, Lung Circ. 2008; 17:370-374. Mahrholdt H, Wagner A, Judd RM, et al. Delayed enhancement cardiovascular magnetic resonance assessment of non-ischaemic cardiomyopathies. Eur Heart J.2005;26:1461-1474. Ichinose A, Otani H, Oikawa M, et al. 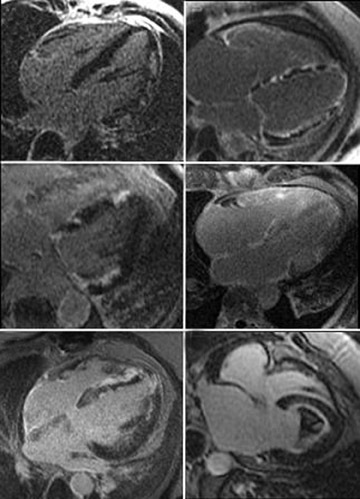 MRI of cardiac sarcoidosis: Basal and subepicardial localization of myocardial lesions and their effect on left ventricular function. AJR Am J Roentgenol. 2008; 191:862-869. 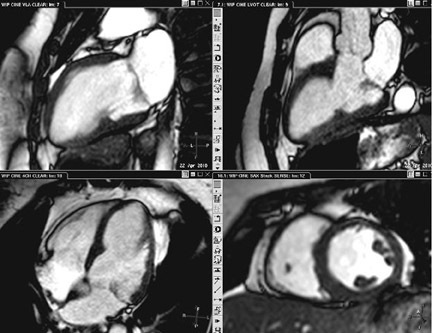 Hansen MW, Merchant N. MRI of hypertrophic cardiomyopathy: Part 2, Differential diagnosis, risk stratification, and posttreatment MRI appearances. AJR Am J Roentgenol.2007;189: 1344-1352.
vanden Driesen RI, Slaughter RE, Strugnell WE. MR findings in cardiac amyloidosis. AJR Am J Roentgenol. 2006;186:1682-1685. Hamilton-Craig CR, Harker J, Strugnell WE, Slaughter RE. Diagnostic features of endomyocardial fibrosis by cardiac MRI. Heart, Lung Circ.2008;17:S52. Anderson LJ, Holden S, Davis B, et al. Cardiovascular T2-star (T2*) magnetic resonance for the early diagnosis of myocardial iron overload. Eur Heart J. 2001;22:2171-2179. Mollet NR, Dymarkowski S, Volders W, et al. Visualization of ventricular thrombi with contrast-enhanced magnetic resonance imaging in patients with ischemic heart disease. Circulation. 2002; 106:2873-2876. Ohyama H, Hosomi N, Takahashi T, et al. Comparison of magnetic resonance imaging and transesophageal echocardiography in detection of thrombus in the left atrialappendage. Stroke. 2003;34:2436-2439. Schwammenthal E, Chen C, Benning F, et al. Dynamics of mitral regurgitant flow and orifice area. Physiologic application of the proximal flow convergence method: clinical data and experimental testing. Circulation. 1994;90:307-322. D’Ancona G, Biondo D, Mamone G, et al. Ischemic mitral valve regurgitation in patients with depressed ventricular function: Cardiac geometrical and myocardial perfusionevaluation with magnetic resonance imaging. Eur J Cardiothorac Surg. 2008; 34:964-968. Gelfand EV, Hughes S, Hauser TH, et al. Severity of mitral and aortic regurgitation as assessed by cardiovascular magnetic resonance: Optimizing correlation with Dopplerechocardiography. J Cardiovasc Magn Reson. 2006;8:503-507. Cawley PJ, Otto CM. Valvular regurgitation: Does cardiovascular magnetic resonance provide additional information compared to echocardiography? Minerva Cardioangiol.2009;57:521-535. Cawley PJ, Maki JH, Otto CM. Cardiovascular magnetic resonance imaging for valvular heart disease: Technique and validation. Circulation. 2009; 119:468-478. Buchner S, Debl K, Poschenrieder F, et al. Cardiovascular magnetic resonance for direct assessment of anatomic regurgitant orifice in mitral regurgitation. Circ Cardiovasc Imaging. 2008; 1:148-155. Devos DG, Kilner PJ. Calculations of cardiovascular shunts and regurgitation using magnetic resonance ventricular volume and aortic and pulmonary flow measurements.Eur Radiol. 2010;20: 410-421. Nagueh SF, Appleton CP, Gillebert TC, et al. Recommendations for the evaluation of left ventricular diastolic function by echocardiography. J Am Soc Echocardiogr.2009;22:107-133. Paelinck BP, Lamb HJ, Bax JJ, et al. Assessment of diastolic function by cardiovascular magnetic resonance. Am Heart J. 2002;144:198-205. Rathi VK, Doyle M, Yamrozik J, et al. Routine evaluation of left ventricular diastolic function by cardiovascular magnetic resonance: A practical approach. J Cardiovasc Magn Reson. 2008;10:36. Rubinshtein R, Glockner JF, Feng D, et al. Comparison of magnetic resonance imaging versus Doppler echocardiography for the evaluation of left ventricular diastolic function in patients with cardiac amyloidosis. Am J Cardiol. 2009;103:718-723. Jain A, Tandri H, Calkins H, Bluemke DA. Role of cardiovascular magnetic resonance imaging in arrhythmogenic right ventricular dysplasia. J Cardiovasc Magn Reson.2008;10:32. Sen-Chowdhry S, Prasad SK, Syrris P, et al. Cardiovascular magnetic resonance in arrhythmogenic right ventricular cardiomyopathy revisited: Comparison with task forcecriteria and genotype. J Am Coll Cardiol. 2006;48:2132-2140. Dalal D, Tandri H, Judge DP, et al. Morphologic variants of familial arrhythmogenic right ventricular dysplasia/cardiomyopathy: A genetics-magnetic resonance imaging correlation study. J Am Coll Cardiol. 2009;53:1289-1299. Koos R, Neizel M, Schummers G, et al. Feasibility and initial experience of assessment of mechanical dyssynchrony using cardiovascular magnetic resonance and semiautomatic border detection. J Cardiovasc Magn Reson. 2008;10:49. Marwick TH. 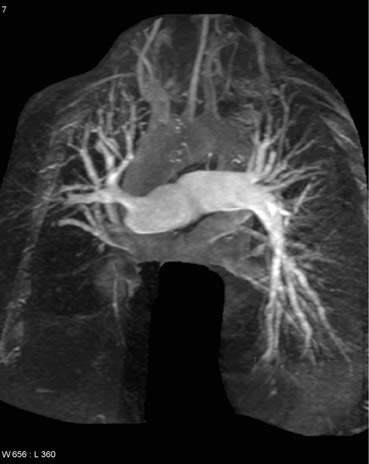 Straining the guidelines with dyssynchrony imaging. J Am Soc Echocardiogr. 2009; 22:251-252. Marwick TH, Starling RC. The riddle of determining cardiac resynchronization therapy response: A physiologic approach to dyssynchrony therapy. J Am Coll Cardiol. 2008;52:1410-1412. Chung ES, Leon AR, Tavazzi L, et al. Results of the predictors of response to CRT (PROSPECT) trial. Circulation. 2008;117:2608-2616. White JA, Yee R, Yuan X, et al. Delayed en-hancement magnetic resonance imaging predicts response to cardiac resynchronization therapy in patients with intraventricular dyssynchrony. J Am Coll Cardiol. 2006;48:1953-1960. Hamilton-Craig C, Kermeen F, Dunning JJ, Slaughter RE. Cardiovascular magnetic resonance prior to surgical treatment of chronic thrombo-embolic pulmonary hypertension. Eur Heart J. 2010;31:1040. Cardiovascular magnetic resonance from basics to clinical applications. Appl Radiol.